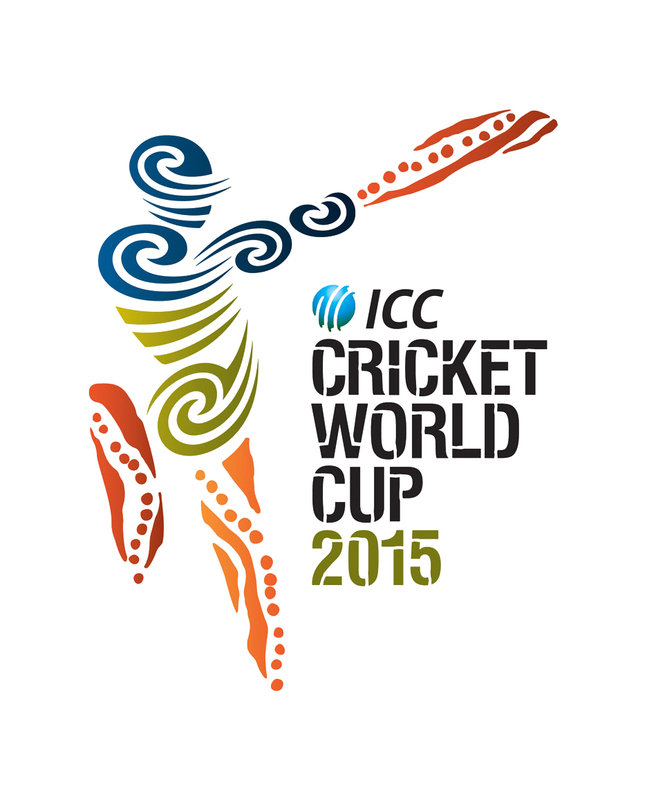 The ICC Cricket World Cup is about to go down in Australia and New Zealand, featuring 14 teams. We will see the ten test playing nations alongside the “minnows” of Ireland, Afghanistan, Scotland and the UAE. The format may not give the associate nations an opportunity to progress, but the opportunity to shine is something that smaller nations will embrace as they have in the previous editions of the “Global” showpiece. From 2019, the ICC Cricket World Cup will feature only ten teams, with the top 8 ranked teams in 2017 (From a list of 12) automatically qualifying. The fact that you get more points for playing the big boys and the big boys play each other the most, means that the likelihood of Ireland or Afghanistan sneaking in will be next to nothing. There will be two qualification places up for grabs, but if Bangladesh and Zimbabwe would enter the chances of seeing a Bermuda, Canada or Scotland at the World Cup would be next to nothing. So instead of lambasting the ICC more, which they thoroughly deserve, we thought we would rather look at some reasons why the Associates deserve to be included in the Cricket World Cup. Some of these will definitely bring a smile to your face. Its hard not to think back at this day and smile. The 2011 World Cup produced a major shock when England took on Ireland. England batted first and posted a really good 327 with half centuries from Bell, Trott and Pietersen. Ireland in the chase found themselves at 111-5 (24 overs) needing a further 227 off just 154 balls. Alex Cusack joined Kevin O’Brien at the crease (O’Brien was on 4) and they produced a remarkable partnership of 162 runs off just 103 balls. Cusack departed as O’Brien hit the triple figures and when O’Brien was run out for 113 off 63 balls the hard work was done and John Mooney saw the team home. To top it all off, when O’Brien lifted his helmet, he revealed a mop of pink dyed hair. West Indies really do not like South African surfaces and started their game against Canada in Pretoria with what would surely be a routine win. They got the fright of their lives though as John Davison produced a brutal upfront attack that Chris Gayle would be proud of. Canada raced to 96 off the first 12 overs with Davison smashing all corners of the ground. At this stage Davison was on 76 off 43 balls. Any thought that a wicket would slow the Canadians down was short-lived as Davison continued his attack and reached his century with a six off the final ball of the 19th over. He would eventually be dismissed for 111 off 76 balls and Canada would collapse to 202 all out, but for a brief moment the World was reminded of the cricketing ability of other nations. A police man by trade, a massive man who gave all arm-chair fans hope in their own ability and an incredible one-handed catch. All of those aptly describe the man who owned the media world during the 2007 Cricket World Cup, Dwayne Leverock. Malachi Jones, the 17-year-old playing his first World Cup match bowled the second over of the day after Bermuda won the toss against India. His first delivery was a length ball just outside the off stump, which Uthappa prodded at nervously. 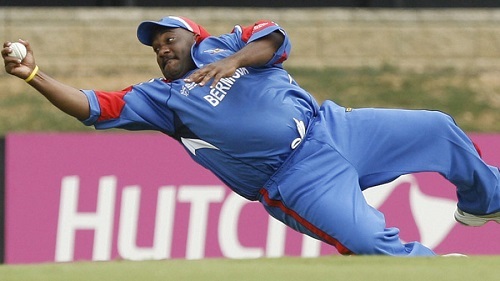 The ball flew to the right of Leverock at wide first slip, and he responded with an athleticism unexpected from a patently overweight man, launching himself to his right to pull off a spectacular one-handed catch. No one cared that Bermuda lost by a record amount and to this day the Leverock catch remains the most indelible and heart-warming moment in Bermuda cricket. 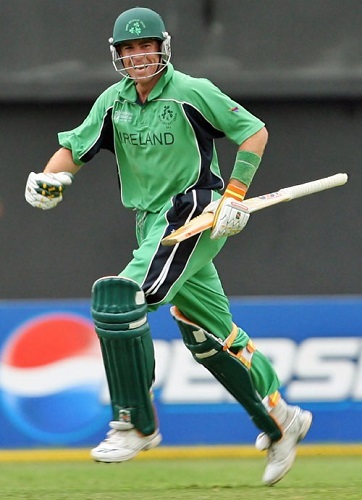 Ireland’s heart warming victory against England in 2011 was not their first major splash in the upset ocean, in 2007 they produced arguably a better result when bowling first they dismissed the Pakistani’s for a miserly 132 with the wickets being shared around and Boyd Rankin taking 3/32. Andre Botha incredibly bowled 8 overs for just 5 runs (2 wickets). 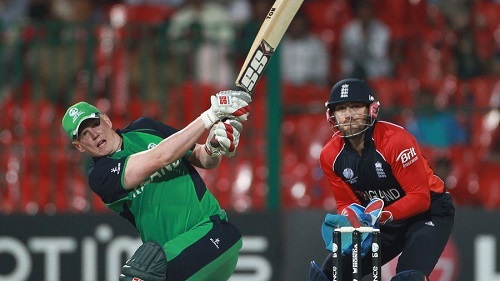 Chasing a lower total can be challenging and Ireland had a stuttered start falling to 15/2. But it was another O’Brien this time as older brother Niall steadied the ship with a solid 72 and Ireland would eventually limp home with a three wicket victory and a place in the next round of the World Cup. Kenya started the 2003 World Cup with a humbling defeat at the hands of the hosts and looked to have very little fight in them. But in the second game they defeated Canada in a humdinger that went down to the wire. Kenya were then given a walkover as New Zealand forfeited against them (New Zealand chose not to play in Nairobi because of security fears). It was game number four that saw them produce their best. They scored 210 against Sri Lanka and then bowled like men possessed to dismiss the 1996 Champions for just 157 (Collins Obuya took 5/24) and followed that up with a solid victory against Bangladesh. A defeat against West Indies didn’t matter too much as the teams that progressed (Sri Lanka and New Zealand) meant Kenya carried 4 points to the super sixes. In the super sixes Kenya beat Zimbabwe massively lost to India and Australia, but secured a place in the semi-finals, and ending the World Cup as the top African team! What were your favourite associate and minnows moments in the Cricket World Cup?